(April 29, 2013) Understanding the forces behind China’s magnitude-7 earthquake in Sichuan Province more than a week ago should sound warning bells. Patricia Adams digs deep into the country’s recent rash of earthquakes in southwestern China and finds the region’s seismic risk is increasingly man-made. China’s new government must be nervous. In the wake of the magnitude-7 earthquake that hit Lushan County on April 20, scientists are asking if the country’s breakneck dam-building program in the earthquake-prone region of south-west China is unleashing a chain reaction of deadly tremors. According to Fan Xiao, geologist and chief engineer of the Regional Geological Survey Team of the Sichuan Geology and Mineral Bureau, this week’s earthquake – which has so far killed nearly 200, injured more than 13,000 and left thousands homeless – may have been an aftershock of the massive magnitude-8 earthquake that collapsed schools and killed close to 90,000 people in May 2008. The two quakes occurred on the same fault. As Fan explains it, “the fault line became active as its stress wasn’t completely released.” This made the region a more dangerous area, he said. But, mounting scientific evidence suggests that the Wenchuan earthquake was more likely a man-made disaster, triggered by the nearby Zipingpu hydro power dam. If true – a review by Fan Xiao of close to 60 scientific studies points to this conclusion – the Chinese public can be expected to ramp up opposition to government plans to build some 130 dams in seismically hazardous southwest China. One of those studies, by Shemin Ge et al. of the University of Colorado in Boulder, argued that China’s massive 2008 earthquake may have been “hastened” by “tens to hundreds of years” by the Zipingpu Reservoir. Building reservoirs in unstable regions like Sichuan, says Ge, might affect the local seismology. Understanding the forces behind the recent quake should sound warning bells. According to New Scientist, many of China’s planned hydrodams lie along fault lines as these form natural sites for river courses. Large reservoirs built on fault lines can induce earthquakes, in a phenomenon known as “reservoir-induced seismicity” (RIS). By adding pressure to fractures, Fan Xiao told the Global Times, a reservoir with a capacity of over 1 billion cubic metres and a dam more than 100 metres tall would have a 30 per cent to 40 per cent chance of inducing an earthquake. The Lushan quake seems to have proved Fan Xiao’s concerns, to deadly effect. In a report published just last month, Fan Xiao documented the recent rash of earthquakes in China’s southwestern region, warning about the probability of reservoir-induced seismicity, and especially the risk of strong RIS in the area. Fan argued that the government’s current plan to build huge, cascading dams close together along the great rivers of Sichuan and Yunnan in actively seismic zones increases the probability that these dams will both induce and be damaged by seismic activity. He added that the next 10 years are an especially dangerous period as scientists have observed that reservoir-induced seismicity is most likely to occur within the first few years after a dam is filled. Typically, it takes time for reservoir water to penetrate deep into seismic faults and fissures before it triggers seismic activity. New concerns are emerging; for example at the 186 metre tall dam Pubugou Dam, which holds 5.39 billion cubic metres of water and where some 1,834 small earthquakes were recorded between October 2006 and December 2011. Pubugou is just 80 kilometres from the epicentre of this week’s quake at Lushan. While it is very difficult to know where or when the next deadly quake will hit, scientists are struggling to understand just what role dams play in triggering a chain reaction of seismic activity. According to Mian Liu, Geological Sciences professor at the University of Missouri in Columbia, the Lushan and Wenchuan quakes may have slightly increased the stresses along the Anninghe fault, further south, making it the area now at most risk. A map of major active faults and the distribution of magnitude 6-plus earthquakes in southwestern China in the period of 1480 to 2007. 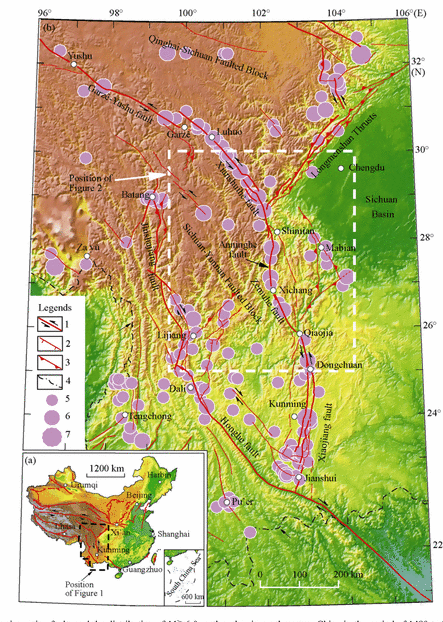 This map is an excerpt from “A Seismic Gap on the Anninghe fault in western Sichuan, China” by XueZe Wen, Jun Fan, GuiXi Yi, YiWei Deng and Feng Long, published by the Science China Earth Sciences journal. The full version of this article is only available via subscription; an abstract and a sample look inside (featuring a clearer rendering of this map] is available here. Fan Xiao calls this man-made seismic risk created by the government’s ambitious plan to turn all natural rivers into reservoirs “a dangerous new reality.” If more killer quakes are linked to dams, they surely will become a lightning rod for public protest. And that must make the Chinese government nervous. See here for an April 30 update by Nature magazine: While scientists agree that China’s deadly tremor at Ya’an (Lushan county) may hint at where future quakes will strike, they disagree on which seismic fault the next rupture is likely to occur.